"The relationship between rising oxygen levels and mantle cooling has implications for any terrestrial planet," says Grant Cox Grant Cox at the University of Adelaide. "All planets will cool, and those with efficient plate tectonic convection will cool more rapidly. We are left concluding that the speed of such cooling may affect the rate and pattern of biological evolution on any potentially habitable planet." A new study proposes that rapid cooling within the Earth's mantle through plate tectonics played a major role in the development of the first life forms, which in turn led to the oxygenation of the Earth's atmosphere. The study was published in the March 2018 issue of Earth and Planetary Science Letters. As Cox, a co-author of the study, explains, the result is that "phosphorus will be concentrated in small percentage melts, so as the mantle cools, the amount of melt you extract is smaller but that melt will have higher concentrations of phosphorus in it." Could a similar scenario be playing out on a possible exo-Earth? With the Kepler discoveries of a growing number of possibly Earth-like planets, could any of these support life? Cawood suggests that the finding is potentially significant for the development of aerobic life (i.e. 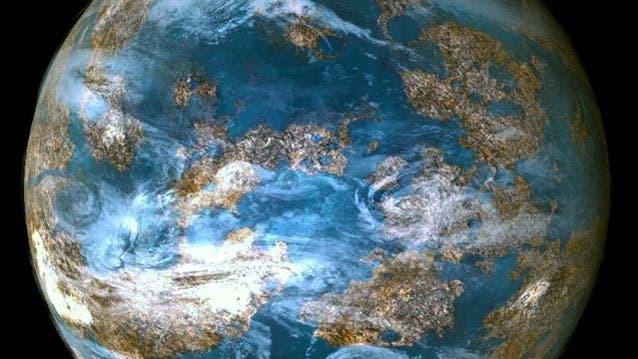 life that evolves in an oxygen-rich environment) on exoplanets. "This is provided that [phosphorus] within the igneous rocks on the surface of the planet is undergoing weathering to ensure its bio-availability," says Cawood. "Significantly, the phosphorus content of igneous rocks is highest in those rocks low in silica [rocks formed by rapid cooling] and rocks of this composition dominate the crusts of Venus and Mars and likely also on exoplanets."